You’ve heard of the digital divide, but how about the app gap? That’s the new term coined by Common Sense Media, which conducted a study looking at the amount of time children under the age of 8 are spending in front of screens. The study found that there is a growing rift between children from wealthier families who spend more time involved in mobile apps and lower-income children who are more involved in traditional TV watching. Common Sense Media, a nonprofit group based in San Francisco, surveyed almost 1,400 parents and found that 47 percent of families with incomes more than $75,000 had downloaded apps for their children, while only 14 percent of families earning less than $30,000 had done so. 52 percent of all 0- to 8-year-olds have access to a new mobile device such as a smartphone, video iPod(s aapl), or iPad/tablet. 38 percent of children this age have used one of these devices, including 10 percent of 0-to 1-year-olds, 39 percent of 2- to 4-year-olds, and more than half (52 percent) of 5- to 8-year-olds. In a typical day, 11 percent 0- to 8-year-olds uses a smartphone, video iPod, iPad, or similar device to play games, watch videos, or use other apps. Those who use mobile devices spend an average of 43 minutes a day doing so. TV is still the most popular choice for occupying the time of children. Common Sense found that children 0-8 years old spend an average of 1:40 watching television or DVDs in a typical day. Infants and toddlers (0- to 1-year-olds) spend 53 minutes per day watching television and DVDs, twice the amount of time spent reading or being read to (23 minutes). The app gap would seem to be extension of the digital divide as lower-income families take longer to embrace certain technologies because of cost considerations. There has always been a gap between wealthier children and poorer kids, when you look at what toys and educational resources they have access to. But it’s interesting to see how mobile devices have become so quickly deployed by parents as both educational and time-killing tools for their kids. Some of this might just be an extension of TV time, with kids just swapping one screen for another. But as more apps proliferate that are designed to educate and engage younger children, it can help make them more digitally savvy at a younger age. That can have bad consequences, and indeed, the American Academy of Pediatricians has long recommended that children under the age of two shouldn’t spend any of time in front of screens. But with more child-friendly software, these mobile devices might be a tool to help children get ahead, creating more of a divide between the haves and the have-nots. The gap should close over time with the decline in prices for mobile gadgets. 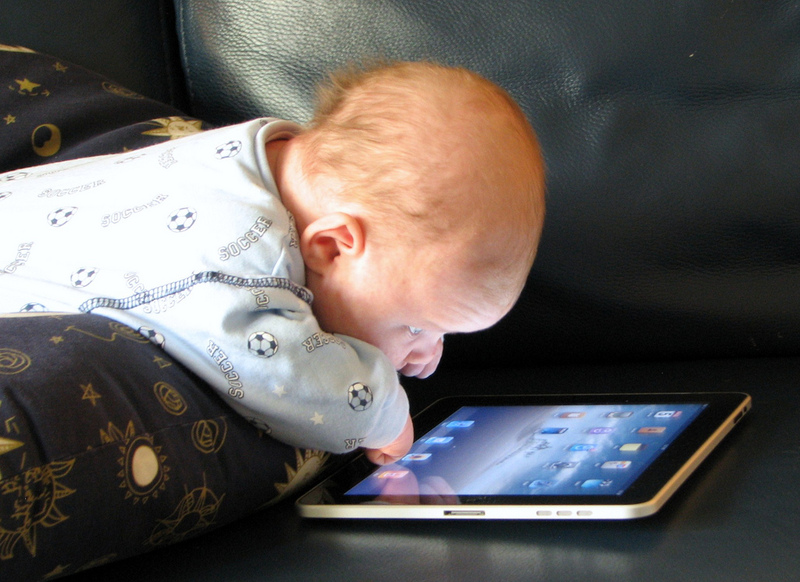 Devices like a $199 Kindle Fire (s amzn) can help open the tablet market to more parents. But the price of software may still be a barrier if children’s apps sell for a premium. We’ll see, but it’s an interesting area to watch. We’re in an app crazy era now, and it’s extending to our youngest children. This is how many of them are learning about computers and software, and the impact on child development and education will be something to keep track of. The digital divide, though closing, still exists and it can leave entire populations behind. The app gap could be having the same effect on children, as well. Trendy and high tech but at the same time children must not be exposed when they are not at their exact age to engaged in this equipment.